This disc received positive assessments by Paul Corfield Godfrey and Rob Barnett, and I can only agree with their verdict. The biblical references, mainly Old Testament, unite these works and make for a very satisfying programme. Undoubtedly for most listeners, it will be the two Ernest Bloch pieces that draw one’s attention to this CD. Schelomo is a favorite and one of the outstanding concertante works for cello of the twentieth century. Voice in the Wilderness, on the other hand, is less familiar and by its nature episodic. It requires a cellist and orchestra with a big sound and real dedication to make it work. 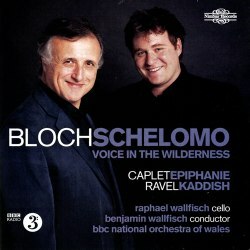 With Raphael Wallfisch and the BBC National Orchestra of Wales (BBC NOW) under the cellist’s son, Benjamin, it has everything to ensure success. From the start one is aware what an accomplished band the orchestra has become, and the cellist’s performance is as eloquent as one could wish. Furthermore, it is all captured in a vivid, spacious recording that ensures that the full range of the orchestra is heard in a natural perspective with the solo cellist. One may never go away from this work with the themes engraved in the memory as they are with Schelomo, but this performance certainly gives one a new appreciation of the piece. Schelomo is a different matter, where the competition is fiercer. There have been many recordings of it by such cellists as Mstislav Rostropovich, Pierre Fournier, and Yo-Yo Ma, but Rafael Wallfisch has absolutely nothing to fear in comparison. In fact, Wallfisch may be just about the best I’ve heard in this work. I compared this new recording with those of Fournier with the Berlin Philharmonic under Alfred Wallenstein (DG) and Ma with the Baltimore Symphony under David Zinman (Sony). Fournier’s is a magisterial performance that is recorded with the cello very close and the orchestra in the background. Fournier plays elegantly and with a lustrous tone, while the orchestra — when you can actually hear them — seems rather scrappy at times. Ma is too discreet in his account with the cello lacking in sufficient presence. His tone seems unusually thin, as recorded, but the orchestra has much in its favor. One can appreciate their full range and the sound does not stint on detail. However, what I find lacking in the Ma/Zinman performance is any real sympathy with the piece. They are too studied and their interpretation lacks spontaneity. Their album, entitled “The New York Album” is still valuable for the world première of Stephen Albert’s Cello Concerto, a wonderful work where they show real feeling and understanding. Wallfisch and Wallfisch have the full measure of Schelomo. The cellist plays with a great deal of expression — passion even — and his big-hearted approach meshes perfectly with that of the orchestra. Yet, nothing is overdone, as can happen with Rostropovich and Bernstein. I reviewed Raphael Wallfisch’s Shostakovich CD set for Nimbus a few years ago and was tremendously impressed with his accounts of the concertos on that set. I am no less impressed here. The BBC NOW has also come into its own with their wonderfully burnished sound, excelling in all sections of the orchestra. I am most familiar with their recordings that have come as cover CDs with BBC Music Magazine, virtually all of which are keepers. Commercially, their Orfeo disc of Martin and Stravinsky violin concertos with Baiba Skride and other twentieth-century orchestral works is winning both as to soloist and orchestra. I hope we get to hear the BBC NOW with even greater frequency on disc. While the real meat of this recording is the Bloch pieces, the Caplet and Ravel round out the album well. Ravel’s Kaddisch is a short song, a prayer in praise to God that Ravel orchestrated in the version heard here. Wallfisch and the orchestra perform it soulfully and movingly. The fourth work on the CD, Caplet’s Epiphanie, is the least known, but is an effective disc mate. The composer was a friend of Debussy and is known for his orchestration of some of the latter’s music. Epiphanie, with its clear textures and French refinement, has the cello part interwoven with the other instruments. The cello solo depicts the Adoration of the Magi and celebration of Christ’s birth, but in an Ethiopian setting. Thus, its exoticism fits in well with the disc’s contents. Epiphanie is divided into three movements, performed without noticeable breaks, the second of which is a cadenza unusually accompanied by a continuous drumbeat played pianissimo. According to the detailed notes in the CD booklet, this drumbeat is a “characteristically Ethiopian element.” The mood lightens for the last movement’s dance. Again, we are treated to a fine performance. Nimbus has thus produced a real winner here. I know I shall be returning to this CD when I need a Schelomo fix and I am equally glad to have heard the other works performed and recorded so well.